Integrating the courses with Digital Chalk, an online training platform, tests and grading are offered, furthering the learning experience. This new platform allows you newbie or rusty sailors access to affordable, individual sailing lessons with a qualified sailing instructor anytime from anywhere. No installation or downloading necessary; all that is needed is an internet connection. Upon completion, video clips of the complete course are delivered to you, the student, via email and can be used as a reference forever. PC, iPad, iPhone, Android and Kindle Fire Tablets Supported. Would you like an online sailing learning experience that feels like a private lesson from a professional sailing instructor? 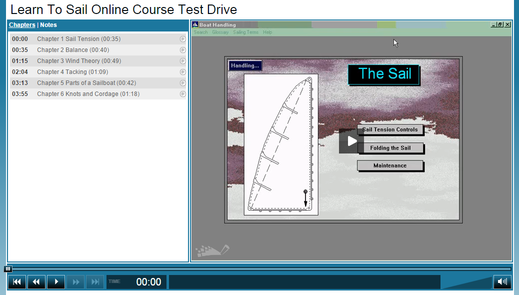 Then you’re ready to test-drive a Learn To Sail Online course! Test drive a free 5 minute sailing course now!